. :: Grand Prix H.R.H the Prince Moulay EL HASSAN Nadja Peter Steiner, Loyalty rewarded ::. Nadja Peder Steiner is one of the faithful of the Morocco Royal Tour: she doesn’t miss an edition of the prestigious circuit since its creation, eight years ago. Sunday, she won the most important class, the Grand Prix of S.A.R Crown Prince Moulay EL HASSAN, both for the FEI Longines World Ranking and for the World Cup (Arab league). If the Swiss rider is not concerned by the last aspect of this event, this victory seems important for her. “It’s been eight years that I come here for nothing and I’d miss this appointment for no reason. Everything is so well organised here, perfect conditions to practice our sport.” After the price giving, Nadja, bright eyes of happiness, was assailed by a forest of microphones and cameras: “ I feel like a star”. Nadja pays tribute to her mare Saura de Fondcombe: “She is incredible, she just made a wonderful season: we did the European Championship where we won the bronze medal, she made Aachen (the most prestigious competition in the world), but until then she had never been in the speed. Today is the first time she jump such a class, she played a game she didn’t know and she did well. We have never been as fast as today and now, I will be able to jump the Grands Prix to come.” She beats Colina Pijnvenhof Z, Dominique Hendrickx’ horse, with two and a half seconds. The Egyptian Karim Elzoghby took the third place with Caveman DH Z. Only one Morocan rider managed to qualify for the second round of this Grand Prix, Samy Colman who could not repeat the performance of the first round, a beautiful clear round with Simara Alia, who unfortunately made two faults. 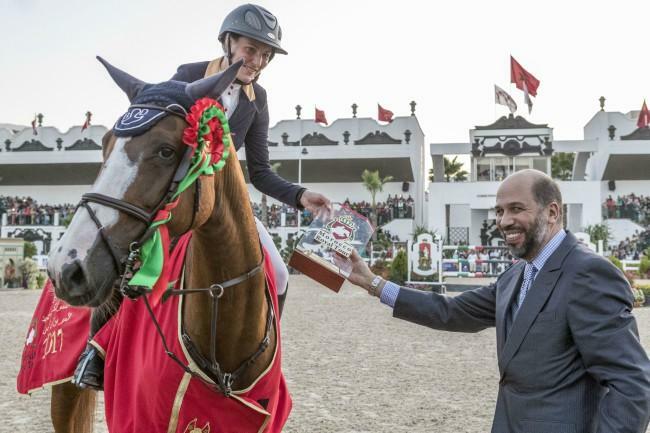 This one-star Grand Prix showed the good health of the Moroccan jumping since among the eleven finalists there were no fewer than eight Moroccan riders. After the success of Tetouan, the Morocco Royal Tour will continue its journey and come back next Thursday in Rabbat, with the Nation Cup, October 13, and another Grand Prix next Sunday.